Twenty years ago, their parents defeated Adrian Ravener and his minions in an epic struggle for survival that had far-reaching consequences for the island of Massa. Now, when the subterfuge of strange visitors from afar turns deadly, will the children be able to do the same? 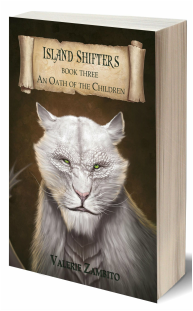 When the Draca Cats from Callyn-Rhe appear on the horizon, are they there to join the shifters or fight them to the death? For even though the cats, too, are the children of oath, their hunger for dominance cannot be quenched. An ancient thirst for blood resurrects from centuries past, but the strangers cannot possibly know what it means to be a shifter. They cannot possibly know about their unbreakable oaths. And, they cannot possibly know that these are not just children. If they did, it is unlikely that they ever would have set foot on the island of Massa.